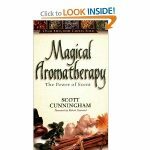 Magical Aromatherapy by Scott Cunningham combines the modern science of aromatherapy with the ancient science of magical perfumery. Together they make a powerful system that can improve your life and bring you what you want. Already, over 170,000 people have found out how useful this book can be. You can, too! In these pages you’ll discover how to use aromas from fresh and dried herbs and essential oils to make changes in your life. You can use them to bring you love, peace, protection, psychic awareness, happiness, joy, and more. You’ll discover that the dried seeds of celery can be used to enhance psychic awareness or bring restful sleep. The fresh flowers of gardenia can be used for peace, love, and spirituality. Honeysuckle can be used for weight loss and prosperity. This book includes full instructions on how to use these three and ninety-seven more aromatics! If you do magical rituals, you’ll also be thankful for information such as the ruling planet and element for each of the herbs. Also given are aromas of the seasons, lunar cycles, days of the week, and zodiacal signs. You’ll also learn how to make, store, and use essential oils. 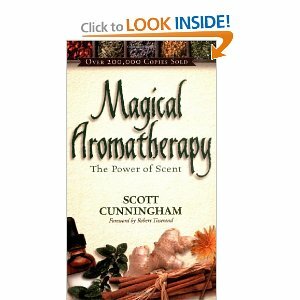 Cunningham also includes addresses of essential oil distributors; fresh and dried plant distributors; and aromatherapy organizations and publications. There’s even a glossary and a great annotated bibliography, as well as a history of magical perfumery. Even if you’ve never done any magic in your life, you can use this book. For example, to attract love, “visualize yourself freely giving and receiving it as you smell the crushed fruits” of the caraway. You can repeat this several times a day, especially if you are worrying about your current relationship. And if you’ve been doing rituals for a long time, you will find this book to be invaluable. The correspondences and information will allow you to use aromatics to enhance any of your rituals. This is truly a book anyone can use.